The Trump/Xi meeting is over and President Trump is calling it the best deal he has ever made. However, no details have surfaced. The post meeting press conference was cancelled because of the death of President Bush. We are to expect a full news briefing late in the week. I am sure the leaks and tweets will give us plenty of details in advance. The market is celebrating with the S&P futures up almost 50 points as I type this. The Dow futures are up +468 and Nasdaq futures +148. The president said China will be buying very large quantities of agricultural products from the US along with major purchases of energy products including LNG. They will be changing their tariff structure and trade barriers. Again, no details yet. The markets had a great week with the Dow up 1,250 points. Investors seemed to be leaning in the direction of a deal of sorts and dips were bought. Shorts, who thought the meeting would turn into a disaster, are going to be in a lot of pain on Monday. With the S&P futures gapping up 30 points at the open, there will be major losses. 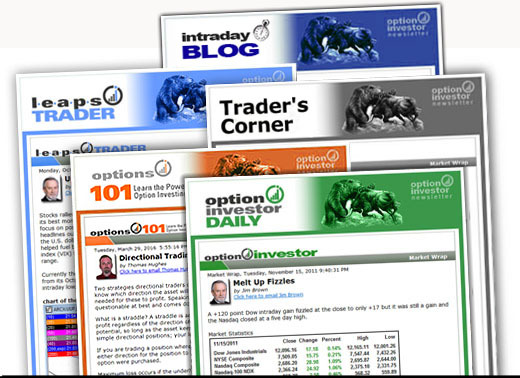 Traders try to buy futures overnight to offset losses on other short equity positions. 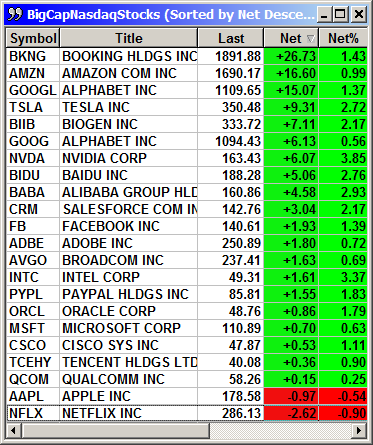 Gapping up 30 points means they have no coverage and they will be racing to cover their equity shorts at the open. The lack of actual details on the agreement is probably a good thing. Since we will not get the details until Thr/Fri that will keep the excitement high and we will be less likely to see a sell the news event until late in the week. The Asian markets are up strongly with the Shanghai up 2.58% and the Hang Seng up 2.61% as of 10:PM ET. Oil prices are up $3 on expectations for China to buy oil from the US and for their economy to recover from the trade war induced fog. We have a busy calendar for next week with all three ISM reports and the three payroll reports. Chairman Jerome Powell gets another chance to correct whatever he meant to say last week. His comment about rates being "just below neutral" was a lot different than his prior October comment of "we are a long way from neutral." Did he really mean to trigger a 1,250-point rally on the Dow? Is he going to walk back that comment with a different phrasing? We will not know until Wednesday. The ADP payroll estimates at 175,000 are a lot lower than the nonfarm estimates at 225,000. However, the nonfarm numbers have been running hot in two of the last three months. September's 118,000 was believed to be low because of the hurricane impact. October's blowout of 250,000 on a 190,000 estimate was believed to be hurricane recovery. November is targeted almost in the middle of the prior two months on the assumption holiday hires will be going to work and the hurricane recovery has moved into a new stage. The fly in our soup is the potential for a partial government shutdown if the funding is not passed by Friday. The holdup here is $5 billion in wall funding. Trump said again on Thursday, this would be a good time to shut down the government over border security given the current events on the border. The Fed Beige Book on Wednesday used to be important. In recent years it has faded because there are only so many ways you can say "moderate growth" and there is no slowdown in sight. They can just take the prior months report, copy it and change the heading. The death of President Bush produced a National Day of Morning and the markets will be closed on Wednesday. 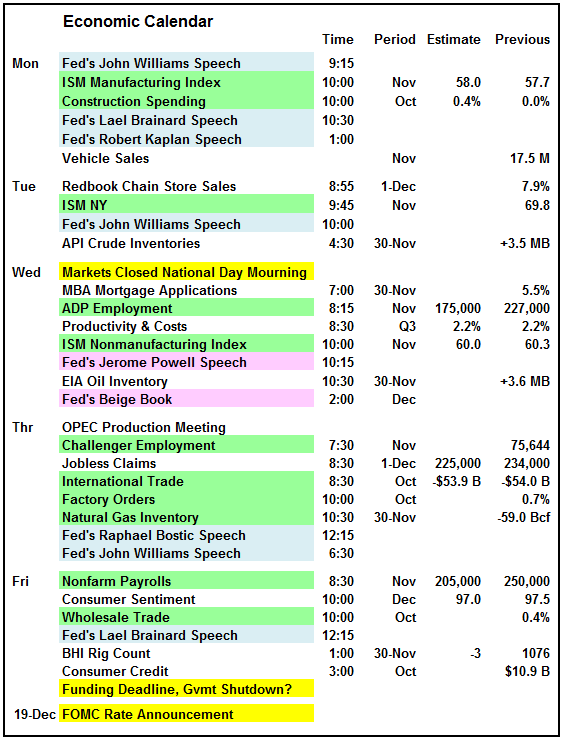 I don't know how that will impact the scheduled economic reports since most are government reports. The ADP Employment will more than likely still be released but schedule changes are possible. The remaining earnings cycle will pick up again slightly now that Thanksgiving is behind us. Autozone, Hewlett Packard Enterprise, Broadcom and Ulta Beauty are highlights for the week. Other notables include Lululemon, Dollar General, Kroger, Smith & Wesson (AOBC) and Toll Brothers. 491 S&P companies have reported Q3 earnings of 28.2% growth. Of those companies 77.4% beat estimates. Revenue has risen 8.5% and 60.9% of companies beat on revenue. There have been 64 guidance warnings for Q4 and 43 guidance upgrades. 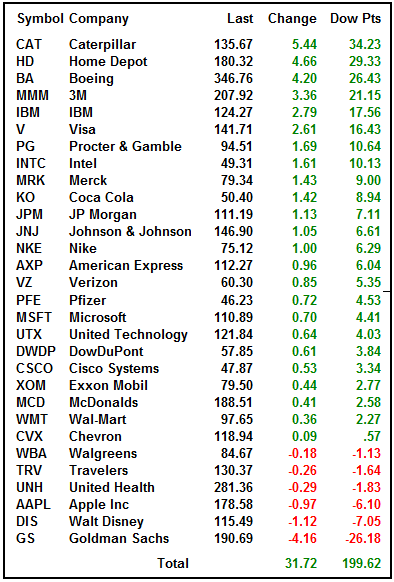 Ten S&P companies report this coming week. Earnings are expected to show 17.4% growth for Q4. Typically, actual earnings come in about 3-4% above initial estimates. The forecast for Q1 is 6.7% earnings growth. That is on top of 26.6% growth in Q1-2018. Earnings are still growing, just not at the breakneck pace of 2018. Revenue growth is expected to maintain a 7% rate in Q4 and Q1. The S&P eased past 2,750 at the bell on Friday to close at 2,760 and right at the 200-day average. The gains for the week were not enough to prevent a death cross of the 50/200 averages this coming week but the index did move above the congestion from 2650-2750. 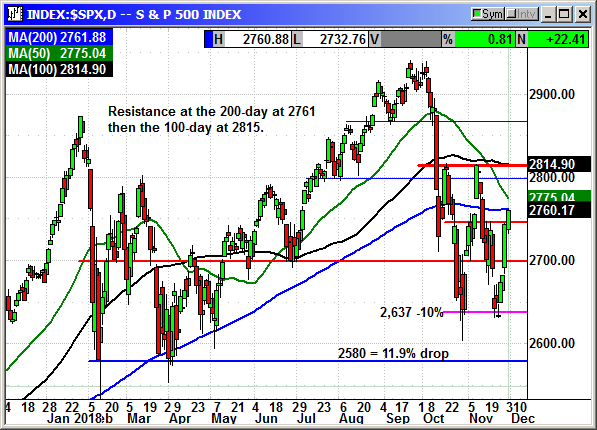 The next resistance challenge after the 200-day average is the November closing high at 2,815 and the 100-day. The Dow had a great week with a 1,252-point gain. Of course, that followed a -1,127 point decline the prior week. 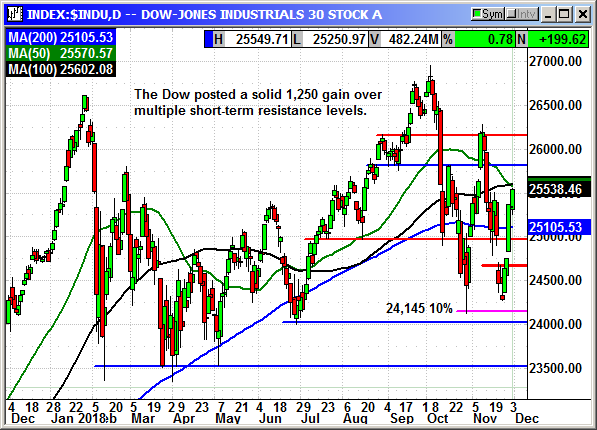 The index pushed through resistance at 24,650, 25,000, the 200-day at 25,100 and 25,500. The close on Friday at the high of the day was 2,5538 and just below both the 50 and 100-day averages at 25,570. 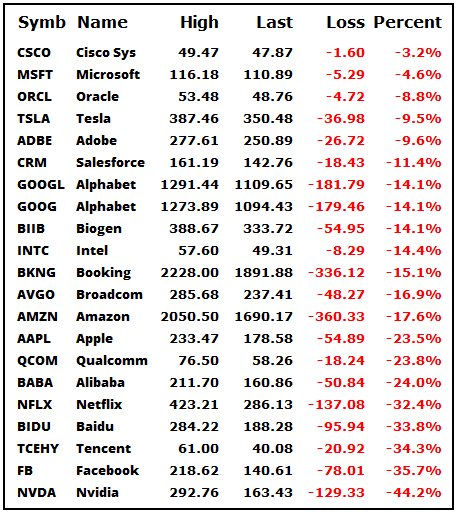 With the positive outcome on the trade negotiations, the tariff sensitive stocks including Boeing, 3M, Caterpillar, Intel and Cisco should explode higher. The Nasdaq has the toughest road to ride. There are multiple levels of strong resistance over the next 300 points. There is lowered high resistance, the 200-day and congestion from the last month of declines. 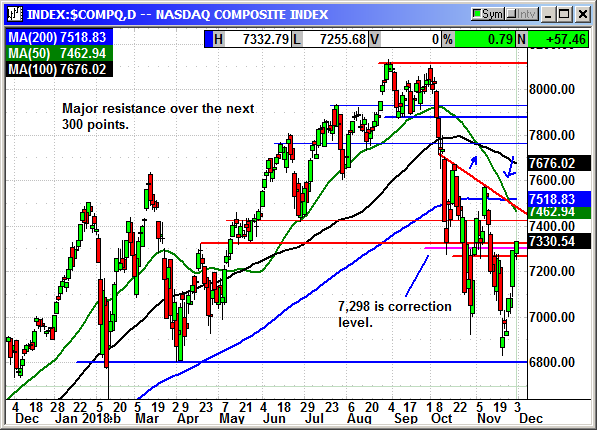 The Nasdaq rebounded nearly 400 points for the week and that put a lot of the individual big cap leaders into overbought territory with a need for consolidation. However, Friday's first six hours of trading was a consolidation period of sorts and that could have paved the way for some decent post meeting gains. 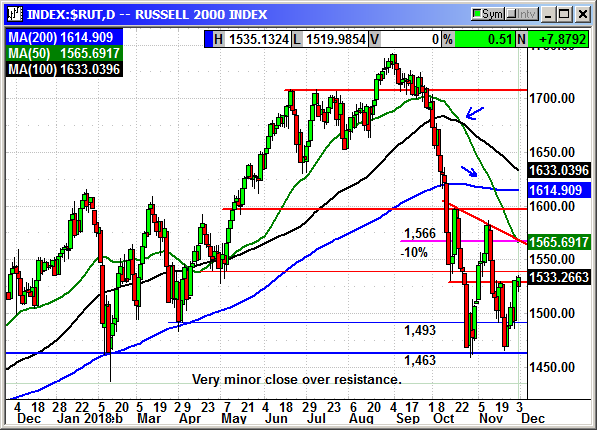 The Russell 2000 closed about 3 points over resistance at 1,530. 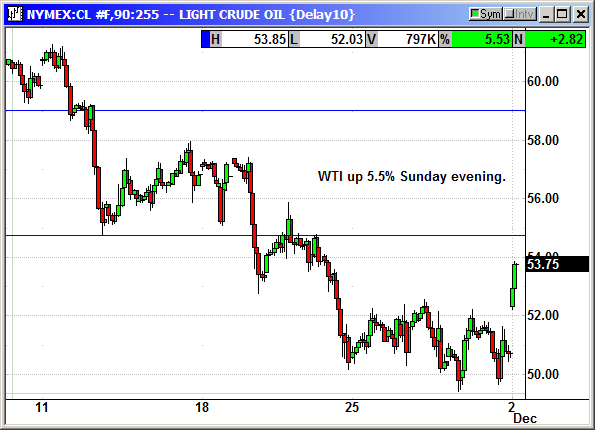 It is poised to rock higher on good news. The Russell futures are up +25 on Sunday. The correction level of 1,566 corresponds with lower high resistance and the 50-day. The Russell will be challenged until it moves over that level. The threat of higher interest rates seems to have passed and that will be positive for future Russell gains. 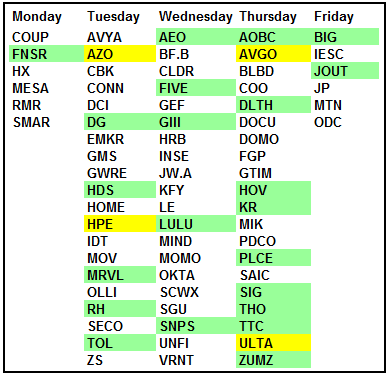 The recommendation for next week is not based on any technical setup. This could be the start of a serious December rally. Any further gains or losses will be based on Powell's speech on Wednesday and the actual details of the trade deal on Thr/Fri. ON YOUR HOLIDAY SHOPPINT LIST!